Discussion in 'Non-Indian Domains' started by Prashant Sharan, Apr 5, 2019. Let's look at the market's performance on 3rd April, 2019. Sedo had the top sale of the day for two days in a row, this time it was HLIO.com which sold for $21,850. NameBio recorded 346 sales $100+ for a total of $212,154 with an average sale price of $613. Compared to the previous day there was an increase of 14% in the number of sales and the total dollar amount increased by 73%. We also recorded an additional 1,150 sales below $100 for a total of $29,286. 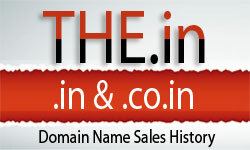 The domain FIKU.com sold for $19,995 at EmpireNames.com for an increase of 1963%. It last sold for $969 on August 25th, 2008 at Sedo. The domain NewsWebsite.com sold for $860 at Flippa for an increase of 493%. It last sold for $145 on February 3rd, 2019 at NameJet. The domain CasinoToday.com sold for $2,500 at Flippa for an increase of 299%. It last sold for $626 on January 13th, 2019 at NameJet. The domain 123.movie sold for $456 at Dynadot for an increase of 81%. It last sold for $252 on April 3rd, 2018 at Dynadot. The domain RxProtect.com sold for $160 at GoDaddy for a decrease of 98%. It last sold for $7,500 on April 19th, 2011 at Sedo.